Peasants in northern Mozambique are struggling to keep their lands, as governments and foreign companies move aggressively to set up large-scale agribusiness projects. They are being told that these projects will bring them benefits. But, so far, the country’s experience with foreign investment in agriculture has been disastrous. This report looks at the companies already setting up agribusiness operations in the Nacala Corridor, an area that the government has prioritised for agribusiness development. These companies, typically structured through offshore tax havens and often connected to Mozambican political elites, have been grabbing lands and extracting wealth in ways reminiscent of the country’s colonial days. Mozambique declared independence on June 25, 1975 after a decade of armed struggle. The peasants, workers, and students of Mozambique had defeated the Portuguese empire, guided by a common ideal of “freedom of man and earth”. The ideals of the national liberation struggle are enshrined in the Republic’s first constitution, which recognises the right of the Mozambican people to resist all forms of oppression. These ideals also resonate in the first national anthem of the Republic of Mozambique, promising to turn the country into the grave of imperialism and exploitation. Land was particularly important to the country’s liberation struggle. Portuguese settlers had occupied vast tracts of the country’s most fertile lands. When Mozambique achieved independence, these lands were immediately taken back and nationalised. Under the 1975 constitution, the state – on behalf of the Mozambican people – became the owner of all lands in the country. The constitution also recognised agriculture as the foundation of development with industry as its main engine, to be underpinned by a policy of national industrialisation led by state companies and cooperatives. One year after independence, a brutal civil war broke out which ended only with the founding of a second republic in 1992 in the wake of the Rome General Peace Accords, signed between the government and RENAMO. Then followed two decades of structural adjustment policies imposed by the World Bank and International Monetary Fund (IMF). Today, 40 years after independence, the revolutionary vision of the national liberation movement is in tatters and the Mozambican government is thoroughly dominated by a neoliberal ideology that relies narrowly on foreign investment for the development of all economic sectors, whether agriculture, infrastructure, fishing, tourism, resource extraction, health or education. Foreign investment in the country has thus expanded rapidly in recent years. According to the National Bank of Mozambique, the net inflow of foreign direct investment (FDI) in 2013 amounted to $ 5.9 billion, up 15.8% from 2012, making Mozambique the third largest destination for FDI in Africa.1 Much of this capital has gone into resource extraction, such as mining and exploration of hydrocarbons. But agriculture is also emerging as an important target of foreign companies, especially in the Nacala Corridor, a vast stretch of fertile lands across northern Mozambique where millions of peasant families live and farm. Over and above this, these investments are the result of a very strong alliance between international capital through the big multinational corporations, with the support of the governments in their home countries with the local political-economic elite with the intention of exploiting the country’s main agro-ecological regions and the potential in mining and hydrocarbons. It is within this context that this research analyses the movements of the different players in the occupation and appropriation of the Nacala Corridor, one of the country’s richest regions, which, besides being home to the country’s main ecosystems, is the repository of reserves of a number of minerals. The rising foreign interest in farmland is not unique to Mozambique. The entire African continent has been seized by a scramble for farmland. Since 2008, foreign companies have been scouring Africa in search of fertile lands to produce agricultural commodities for export. Hundreds of deals have already been signed covering millions of hectares. The rush for African farmland is partly a result of the food price crisis of 2008, which made it difficult for countries dependent on food imports to source the foods they need at affordable prices. In response, some of the richer food importing countries, like the Gulf states, China and Japan, adopted new policies to encourage their corporations to acquire large farms overseas to produce foods for export back to their home countries. Africa is seen as one of the new frontiers where agricultural commodities can be produced cheaply and exported to supply the world’s growing demand. 2008 was also the year of a severe global financial crisis. As stock markets collapsed, the financial industry began to look for new, more secure and profitable assets where it could place the trillions of dollars it manages. Within a couple of years, hundreds of new financial vehicles were created to funnel money into the acquisition of farmland and agricultural operations. On top of this, the world’s dominant food and agribusiness corporations are increasingly interested in Africa. Markets in the North are saturated, and for companies such as Monsanto, Olam, Yara and Nestlé, Africa is a largely untapped source for new profit. However, Africa’s lands, seeds and food systems remain mainly in the hands of small farmers and pastoralists who feed their families and supply local markets outside of the orbit of corporate global food and agricultural chains. For these companies to grow, peasant agriculture has to be replaced with large scale industrial plantations, and local food systems have to be replaced by transnational corporate food chains, from the seeds to the supermarket shelves. The result is that small farmers and pastoralists from across Africa are under increasing pressure from governments and companies to give up their lands and water resources. According to a 2010 World Bank report, more than 70% of the large scale agricultural land acquisitions that have occurred in the world over the past decade have been in sub-Saharan Africa, especially in Ethiopia, Sudan and Mozambique. The Government of Mozambique has unabashedly sought to attract this wave of foreign agricultural investment to its shores, and particularly to the Nacala Corridor in the north of the country. It is partnering with foreign governments and donors, most notably Japan and Brazil, on a massive programme known as ProSavana, which aims to transform 14 million hectares of lands currently cultivated by peasant farmers serving local markets in this area into massive farming operations run by foreign companies to produce cheap agricultural commodities for export. More than 60 social movements, environmental, peasant and other civil society organisations from Mozambique, Brazil and Japan took part in the First Triangular Conference of the Peoples held in Maputo, on 7 and 8 August 2013.2. The objective of the Conference was to strengthen the international articulation of strategies to resist the ProSavana programme. Read more about first Triangular Conference here (in Portuguese), and more about the second one here. Mozambique’s National Peasants Union (UNAC) has been leading a campaign to raise awareness about the situation in the Nacala Corridor and to oppose ProSavana. Strong national and international opposition has helped to slow down the project and derail some of its more aggressive land grabbing components. This does not mean that the government and foreign companies have given up on taking control of the lands and water resources of the Nacala Corridor for large scale agribusiness. In January 2014, high level government officials and businessmen gathered for the presentation of a new development project in the Lúrio River Basin. The development involves a massive farm project along the Lúrio River, at the intersection of the provinces of Niassa, Nampula and Cabo Delgado. The $4.2 billion project is being overseen by a company called Companhia de Desenvolvimento do Vale do Rio Lúrio which appears to be run by TurConsult Ltda. TurConsult is owned by Rui Monteiro, an influential businessman in Mozambique’s hotel and tourism industry, and Agricane, a South African company that has provided consulting and management services to many large-scale agribusiness projects in Africa, especially in the sugar industry. It is not clear who is providing finance for the project. The company’s plan is to construct two hydroelectric dams of 40 MW and 15 MW on the Lúrio River and to create an irrigation scheme covering 160,000 ha, as well as the development of around another 140,000 ha for rain fed agriculture, contract farming and livestock production. The project will focus on the export production of cotton, maize, cereals, and cattle, as well as sugar cane for biofuel ethanol. Preliminary estimates are that upwards of 500,000 people living in the area will be affected by the project. As with ProSavana, the details of this project are being kept hidden from the public, with only anonymous sources citing that it has already been submitted to the Agriculture Ministry for analysis, with expectation that it will be approved at the Council of Ministers, as required by law for projects of this magnitude. The Lúrio River project and ProSavana should not be seen separately. They are part of a broader push, involving the World Bank and the G8’s New Alliance for Food Security and Nutrition, to open Mozambique up to large scale agribusiness projects. The G8’s New Alliance was proposed by the US government and signed by some 40 states, international financial institutions and multilateral organisations at the 2009 G8 Summit in L’Aquila, Italy.3 Under the New Alliance, a Framework Agreement was signed with Mozambique and translated into a national public policy, the National Agricultural Investment Plan (PNISA), which has become the blueprint for agricultural development in Mozambique. The governments, companies and agencies promoting ProSavana and the other projects in the Nacala Corridor maintain that local farmers will benefit from in the new investment, infrastructure and access to markets. They also say that peasants will not be displaced from their lands to make way for corporate farms. Yet it is apparent that these projects are already encouraging land grabs in the Nacala Corridor. 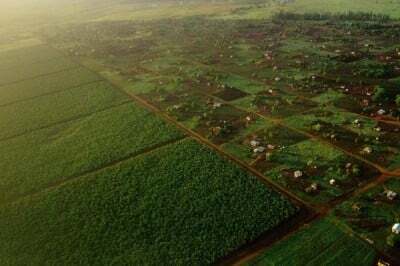 A number of foreign companies, some in collaboration with local businesses linked to members of Mozambique’s ruling FRELIMO party, have already acquired large areas of farmland in the area and have displaced thousands of peasant families. The money that is now pouring into agribusiness in the Nacala Corridor is essentially recreating what the local people experienced under Portuguese colonialism. During the colonial period, the administration generously handed out the most fertile lands in the area to Portuguese investors. At times the Mozambicans farming the lands were given small amounts in compensation, but most often they were simply evicted. With independence in 1975, the Portuguese investors fled and the local people returned to their lands to resume farming. In some cases, state companies took over the colonial plantations, but few of these companies were able to maintain production, and communities later reclaimed much of this land as well. Mozambique’s land law gives communities possession over lands that they have farmed for over 10 years. So these former colonial estates should now have formally reverted to local farmers. But as the area has once again become a target for foreign investment in agriculture, the Mozambican government is colluding with foreign investors to provide them with long term leases over these same lands. The colonial echo is strengthened by the fact that some of the investors are Portuguese families that became rich during the colonial period and are now coming back to Mozambique to set up plantations on the very same lands Portuguese colonialists fled 40 years ago. Few of them have backgrounds in agriculture but many have connections with influential members of the ruling FRELIMO party who help them acquire lands and manage any opposition from local communities. Often the communities are not even aware of who is grabbing their lands. The companies that take possession of their lands are typically registered in offshore tax havens like Mauritius where the identity of the owners of the companies and the financial records are kept secret. This leaves the Mozambican authorities and affected communities few options to hold these companies to account for their actions or ensure that a minimum amount of their profits stays within the country. This report, based on available articles, official documents, interviews and field reports, provides detailed information about cases of land grabbing for agricultural production that are already occurring in the Nacala Corridor. It exposes some of the key players involved and shows how foreign investors and their industrial model of agribusiness are wreaking havoc on the local peasant communities and their food systems. These land grabs provide a clear picture of the kind of “investment” Mozambican peasants can expect from ProSavana, the Vale do Rio Lurio project and other initiatives to encourage foreign investment in agribusiness in the country. The Mozambique Agricultural Corporation (Mozaco) was established in Mozambique in June 2013 by Rioforte Investments and João Ferreira dos Santos (JFS Holding). The area occupied by Mozaco in Natuto community, Administrative Post Canhunha, Malema District, is an area that in colonial times was occupied by a settler called Morgado, who produced tobacco and cotton on around 1,000 ha. After independence, the government nationalised the lands and installed a state company known as Unidade de Namele, which also operated farms in Ribaué and Laulaua Districts. At its height, the state farm employed 5,000 workers but, by 1989, with the civil war intensifying, it was shut down. Under Mozambican land legislation, families who have occupied and farmed lands for more than a decade, such as those farming the lands of the old Unidade de Namele farm, are supposed to be granted DUATs that prohibit any company or state agency from displacing them from the lands unless it is clearly in the public interest, such as for the construction of hospitals, schools or highways. However, local farmer leaders say that Mozaco has already evicted 1,500 farmers to make way for their operations. The organisation ADECRU calculates that several thousand more will lose their lands if the company is allowed to expand to 20,000 ha.9 And access to land is only part of what’s at stake for the communities: Mozaco no doubt chose the area because it is situated between two important rivers, the Malema and the Nataleia, where 4,500 families live and farm. These families now risk losing access to their lands and the water they need to farm and survive. Rioforte is a Luxembourg-headquartered company that was set up in 2009 to hold the non-financial assets of Grupo Espirito Santo – a Portuguese financial dynasty with deep political connections that is currently embroiled in perhaps the worst economic scandal to ever hit Portugal. In May 2014, the Banco de Portugal issued an audit questioning the financial stability and transparency of Grupo Espirito Santo’s main company, the Banco Espirito Santo. This was followed in August, by a controversial €4.5 billion rescue of Banco Espirito Santo, with backing from the EU. As part of the rescue package, Banco Espirito Santo was divided into two banks: one composed of the “good assets” and one composed of the “toxic assets”. These toxic assets consisted mainly of the bank’s investments in the largely unregulated and unaudited companies of the Grupo Espirito Santo. It is not clear what will now happen with Mozaco and Rioforte’s other farms. In July 2014, Rioforte Investments, with nearly 3 billion euros in debts, requested protection from its creditors in a Luxembourg court – a request that was granted. But in October 2014, the Commercial Court of Luxembourg reversed its decision and ruled that the BES Group subsidiary was to be liquidated and the resulting funds used to pay off its creditors. Grupo Espírito Santo’s efforts to appeal the decision were denied. Through the privatisation process, Agro Alfa was taken over by the Portuguese businessman José Adelino Nogueira Aires Alves and Jacinto Sabino Mutemba of Mozambique. In 2011, a Chinese company, Tianjin Machinery Import & Export Corporation, and a Cyprus-based company, V&M–Import and Export Agents (Pty) limited, made significant investments in the company’s share capital. José Alves and Jacinto Mutemba now own 26.6% of the company each while V&M owns 26.4% and Tianjin Machinery owns 16%. Agro Alfa is also pursuing the acquisition of lands in the nearby community of Vida Nova, also in Monapo District. Here too Agro Alfa has been trying to get rights over two former colonial farms of around 2,000 ha. The local farmers had been evicted from these farms during the colonial administration to make way for concessions to Manuel Logrado and Manuel dos Santos, both of Portugal. With independence in 1975, the lands were reclaimed and farmed once again by the local people of Vida Nova and the other surrounding communities of Micolene, Numacopa, and Napepele. It is not clear if Agro Alfa is acquiring the lands for its own operations or on behalf of other investors, perhaps in partnership. The company is closely connected to at least two other active investment companies in Mozambique: Rural Consult Ltda, which is controlled by Jacinto Mutemba, and Tsemba Sociedade de Desenvolvimento Ltda, which is a partnership between Agro Alfa and influential businessman Carlos António da Conceição Simbine, an important player in the newly established Moza Banco. The profile of AgroMoz company speaks volumes about the transformation under way in the Nacala Corridor. This company, a partnership involving the richest man in Portugal, the former president of Mozambique and one of the largest land holders in Brazil, has set up operations in the heart of the area’s soybean producing zone. Her story shows how the displacement of people from Wakhua puts pressure on lands in other areas and creates risks of more land conflicts. AgroMoz has not fulfilled its promise to the community to construct a clinic and a school. It is, however, already badly affecting the health of the local people. Last season the company commenced aerial spraying of pesticides on its soybean crops. Despite the opposition from local people and the destructive impacts that the company has had so far, the Mozambican government granted AgroMoz a DUAT for 9,000 hectares in Lioma. At the time, Armando Guebuza, one of the investors in AgroMoz, was still president of the country. AgroMoz is reported to be a joint venture between the Grupo Américo Amorim of Portugal, a holding company of Portugal’s richest man Américo Amorim, and Intelec, which the US embassy has described as “an investment vehicle for President Guebuza”28 The Pinesso Group of Brazil, which operates farms on over 180,000 ha in Brazil and 22,000 ha in Sudan, handles the agricultural operations, but it is not clear if they also own a share in the company. Information from company registry documents and employee websites suggests that AgroMoz is in fact part of AGS Moçambique, SA., a Mozambican company owned by two Portuguese subsidiaries of Grupo Amorim (Solfim SGPS and Sotomar – Empreendimentos Industriais e Imobiliários, S.A.) and ESF Participaçoes, a subsidiary of ESF Investimentos, which is owned by Intelec and SF Holdings, both of them headed by Guebuza’s main business partner Salimo Abdula. One of the big ideas for the Nacala Corridor is to turn it into a major production zone for poultry. Various companies and donor projects have been trying, in different ways, to stimulate US-style contract poultry farming and the cultivation of crops for feed, particularly soybeans, within the area. New Horizons was not only set up to do business, but also “to see God’s kingdom extend into rural Africa.” The company, through close partnership with the Newfrontiers evangelical church in Zimbabwe, is constructing what it calls a “Community of Fusion” in the area, that integrates poultry operations, religious schools, and churches. One of the companies that became part of this “community” in 2011 is the Center Fresh Group – the second largest egg producer in the US, with around 25 million hens in their farms at any given moment.32 Through a joint venture called Mozambique Fresh Eggs, with New Horizons and Eggs for Africa, another poultry company within the “community” that is run by the Newfrontiers Church, Center Fresh is building and operating large-scale egg laying operations. “It’s very good land. But the people just don’t have the knowledge. I think the whole region is going to be the next big agriculture boom,” says Center Fresh Group partner Bruce Dooyema. “The problem with Africa as a whole, is there is no economy,” says Rei do Agro consultant Wallie Hardie. As they were considering their investment in Mozambique, the owners of the Center Fresh Group brought in Jes Tarp and Paul Larsen to Nampula to see if they could set up farming operations similar to what the two had done in Ukraine. Tarp and Larsen’s company, Aslan Global Management, had already raised funds in the US to acquire and operate on 10,000 ha in the Ukraine. Aslan, through its Mozambican subsidiary Rei Do Agro, acquired a DUAT for 2,500 ha,”with a commitment for 10,000 additional hectares”, from the Mozambican government in Gurúè, Zambezia, about 130 km west of the New Horizons poultry operations, as well as a 42,000 ha cattle ranch in Morogoro, Tanzania. Both areas are epicentres of land conflicts between foreign investors and local people. The funds of these “ordinary” Americans are channeled into Aslan Global and Rei do Agro through a complex web of companies located in offshore and tax friendly jurisdictions, from Mauritius to the US State of Delaware.36 These companies are connected to numerous other companies managed by Tarp, Larsen and/or their business associate Quentin Silic that are registered to the same Naples, Florida address. Tarp is a former evangelical pastor from Denmark and Larsen is a financial manager with a dubious past, who is heavily involved with new church-based financial schemes. Larsen and Silic were permanently barred from the US securities industry by the Financial Industry Regulatory Authority (FINRA) in 2011. This was after Paul Larsen racked up 15 disclosure events in 4 years, involving millions of dollars in claimed losses from his clients.37A disclosure event is a regulatory action, sanction, lawsuit, customer complaint, criminal conviction or termination. Corredor Agro is a Mozambican company controlled by two wealthy European families: the Von Pezold family of Germany and Austria and the Hoegh shipping dynasty of Norway. The company has recently established two farms in Nampula: the 2,200 ha Meserepane Farm, where it cultivates field crops, and the 6,000 ha Metocheria Farm, where it grows bananas. It also runs contract production projects, notably for cassava in a tie-up with the beer company SABMiller. Workers at the company’s banana plantation went on strike in July 2010 demanding better wages, health care, an end to evictions without just cause, and the expulsion of some members of the board. The Mozambican government eventually fined the company $200,000 for violating Mozambique’s labour laws. Local communities are also upset about the lands that the company has acquired. The community at Metocheria says consultations over land were badly conducted, with poor information and false promises. “Matanuska came to deceive and hurt people because it took all of our fertile land, limited access to the Monapo River and now there is much poverty and hunger is getting worse,” says one resident. Höegh Autoliners Chairman Leif O. Høegh and Mozambique’s then First Lady, Her Excellency Maria Da Luz Dai Guebuza, October 2011. “Chiquita made a strategic decision to invest in Africa differently than it has invested in Latin America. The company will not invest directly in land or cultivation, but will partner with a local investor who buys/leases the land,” says the US Embassy cable. Hoyo Hoyo is a Mozambican company, established by Quifel Resources, a Portuguese conglomerate controlled by the aristocrat and racing car driver Miguel Pais do Amaral. The company has two DUATs: one in Zambezia for 20,000 ha and another in Tete for 8,000 ha. Hoyo Hoyo commenced operations on the Zambezia lands, on an old state farm in area around the village of Ruace in the district of Gurúè. These lands had been reoccupied by local people shortly after independence in 1975. A survey in 2012 found there were 836 farmers working 1,945 ha of the 3,500 ha Hoyo Hoyo intended to use. Hoyo Hoyo promised the people it would provide compensation and would prepare new lands for resettlement, but this did not materialise. “I was expelled from my land, which I inherited from my parents, with promises of new land to work on and 680 dollars in compensation. Since I was expelled, one year ago, all I was paid is about a quarter of the amount they promised to pay, and there is no information about the new land to work on,” says Delfina Sidónio, a mother of three, who was evicted from her lands by Hoyo Hoyo. “Our life was all in that land. That land gave us food and supplies – our life style,” says Ernesto Elias, head of the smallholders’ association forum in Ruace. “The last harvest crops are now finishing in our storehouses and from the next two months we don’t know how we will survive,” says another smallholder farmer, Fatima José, who lost lands to the company. Hoyo One Ltd appears to be owned by the BXR Group of the Netherlands through its Dutch subsidiary Hoyo Hoyo B.V. BXR, which is owned by the Czech billionaire Zdenek Bakala and “trusts” associated with Credit Suisse bankers, has recently begun to invest heavily in farmland, with over 60,000 ha in Argentina, 12,000 ha in Brazil and 1,000 ha in Malawi. In 2009, the Government of Mauritius established the Regional Development Company Ltd (RDC) to carry out investments in Mozambique, particularly in food production. • Sri Rajeswari Oil Traders of India, which is pursuing oilseed production on 4,000ha. Information has not been made public as to whether an investor has been allocated the lands in Canacué. The deadline for companies to submit expressions of interest was May 27, 2013. ACA is the largest contract farming operator in Gurúè , Zambezia, with 844 soybean contract farmers on 1250 ha. These contract farming operations have been heavily backed by the Swiss Agency for Development and Cooperation, through a project called InovAgro. The project involves a 3-year contract farming arrangement with local farmer cooperatives to produce soybeans for ACA’s poultry farm (known as King Frango), under which the Swiss provide microfinance and cover 50% of the costs of machinery and 70% of the operating costs (2nd year 50%, 3rd year 30%). But ACA has its sights set on more than contract farming. In the same area oef Gurúè, it acquired a 1,000 ha DUAT and has started large-scale farming. Meanwhile, in Lichinga, it received an even bigger 3,800 ha DUAT on the lands of a former state farm. Its Lichinga operations are handled through a joint venture company called African Century Matama Limitada (AC Matama) that is 20% owned by the Fundaçao Malonda – a foundation owned by the Government of Mozambique and the Swedish International Development Agency.53 AC Matama’s support from European development agencies also comes through a $500,000 tranche of financing in 2014 from AgDevCo, a UK-based company that is supported by the UK, Dutch and Norwegian governments. “I passionately believe in the need to get red-blooded capitalism into Africa,” says Chenevix-Trench. Trigon Capital is a company based in Estonia that is controlled by Finnish businessman Joakim Johan Helenius and the Finnish private equity firm Thominvest Oy.58 Its subsidiary Trigon Agri A/S, based in Denmark, was established to raise funds for the acquisition of farms in Eastern Europe. By 2014, it had amassed farmland holdings of around 170,000 ha in the Ukraine and Russia, as well as dairy farms in Estonia. His company’s first acquisition was Mocotex LLC, a cotton company with farming operations in the Mocuba District of Zambezia Province. Trigon claims that Mocotex has a 1000 ha commercial farm and overall access to 18,800 ha of “prime arable land” that is part of a former state-owned farm. According to a Trigon brochure, Trigon and its investors acquired 51% of Mocotex, with the other 49% remaining with its South African owners. Mocotex was established in 1997 by the South African government’s Industrial Development Corporation (IDC) and a mysterious company called Caravel – Development International Projects Inc (Caravel Development). In December 2009, IDC sold its 75% stake in Mocotex for $10,000, with 25% going to Caravel and 50% going to another mysterious company called Aristo Group Trading. Then, in April 2013, the Aristo Group sold 20% of its shares to the South African, Graham Hewlett, who, along with his brother John Hewlett, have a long history of involvement in corporate farming in Mozambique.61 Graham Hewlett is now managing the Mocotex operations for Trigon. 1 Banco de Moçambique, Relatorio Anual 2013. 3 The G8 claims that this initiative will lift 50 million Africans, including 3.1 million Mozambicans, out of poverty by 2022. Ten African countries have so far signed framework agreements under the New Alliance: Benin, Burkina Faso, Côte d’Ivoire, Ethiopia Ghana Malawi, Mozambique, Nigeria Senegal, and Tanzania. 4 Vunhanhe e Adriano (2014), Segurança Alimentar e Nutricional em Moçambique: um longo caminho por trilhar, artigo ainda publicado. 7 Rioforte Annual Report 2013. 8 Interview with a community member affected by the Mozaco project (Malema, July 2014). 9 Clement Ntauz, “Peasants accuse presidential candidates of marginalising small scale agriculture“, ADECRU, 6 October 2014. 10 Lei de Terra e o decreto n.º 31/2012, de 8 de Agosto, Regulamento sobre o Processo de Reassentamento Resultante de Actividades Económicas. Point 2, Article 24 of Decree No 31/2012 states that resettlement without proper authorisation of the competent authorities is subject to a fine of between 2-5 million MT to MT ($60-150 thousand) and the implementation of an unauthorised resettlement plan is subject to a fine equal to 10% of the budget of the overall project. 11 Rioforte, Consolidated Financial Statements for 2013. 12 Eric Ellis, “Downfall of a dynasty: The last days of Ricardo Salgado and Banco Espírito Santo“, Euromoney, 14 October 2014. 13 Rioforte, Consolidated Financial Statements for 2013. 14 This claim is made by the US Charge d’Affaires Todd Chapman in a cable released by Wikileaks. 15 Oksana Evguenevna Colomies Mandlate, “Ligações a Montante dos Grandes Projectos de IDE e Diversifica- ção da Economia: Estudo de Caso de Quatro Empresas ligadas com a Mozal“, 2013. 16 Clement Ntauz, op cit. 17 Clement Ntauz, op cit. 18 “Portuguese groups Visabeira and Amorim “import” banking experience from Angola to their partnership in Mozambique” Macauhub, 7 November 2011. 19 Website of the Aldira Group: Equipe (accessed 6 January 2015). 20 Suaves Planos Ltda was involved in one investment in Mozambique involving the creation of a company called Forma Redonda – Moçambique, Limitada in 2012. “Sérgio Alves suspende lugar na vereação“, Jornal Vilaverdense, 25 January 2011. Information on Carlos Jorge Martins Pereira’s links to Suaves Planos can be found here: http://tinyurl.com/onqnego. 21 Júlio Paulino, “Mozambique: More than 1,000 people displaced from their lands in Lioma“, @Verdade, 24 October 2014. 23 Jorge Rungo, “Agromoz introduz arroz de sequeiro”, Jornal Domingo, 6 April 2014. 24 Júlio Paulino, op cit. 25 The information on the situation in Wakhua comes from Júlio Paulino, op cit. 26 Júlio Paulino, op cit. 27 Júlio Paulino, op cit. 28 See the cable from US Charge d’Affaires Todd Chapman released by Wikileaks. 29 Penny Hayler, “New Horizons – an inclusive poultry business”, Wellspring blog, 26 October 2009; ATMS Newsletter, “Poverty alleviation in Nampula, Mozambique. Project feature – New Horizons”, 3rd quarter, 2009. 30 Boletim da Republica, 30 November 2007. CAZZ Services Limited is a company registered in BVI (1057177) and was stricken from the Register of Companies on 1 May 2013 for the non-payment of annual fees:http://tinyurl.com/n5azlzn. 31 Boletim da Republica, 30 November 2007 and 29 April 2011; Annie Linskey, “Koch-Founded Super-PAC Draws $500,000 Donor in First Days“, 15 July 2014. 32 Mozambique Fresh Eggs is 50% owned by CFG, 25% by New Horizons and 25% by Eggs for Africa, another company of the Community of Fusion that handles the marketing of the eggs in Nampula. 33 Michele Linck, “Sioux Center partners aim to boost ag in Mozambique“, Sioux City Journal, 26 March 2010. 34 Mikkel Pates, “Expanding in Africa“, Agweek, June 2013. 35 Dan Charles, “Mozambique Farmland Is Prize In Land Grab Fever“, NPR, June 2014. 36 The company’s subsidiaries include: Aslan Global Management (Delaware, USA -2009), Aslan Global Management (Florida, USA -2009), AG Management-Mozambique, LLC (Delaware, USA -2009), AG Management-Mozambique, LLC (Florida, USA -2009), Rei Do Agro Limitada (Mozambique – 2009), Rei do Agro Holdings (Mauritius -2010), Tarp Holdings LLC (Florida, USA – 2010), Aslan Global Management Africa Ltd (Mauritius – 2011), Aslan Group Land Holdings LLC (Florida, USA 2012), and Aslan Group Land Holdings Africa Ltd (Mauritius – 2012). 37 FINRA BrokerCheck Report, 24 October 2014. 38 Brian Mahany, “REIT Fraud Alert – Paul Larsen“. 39 Christopher J. Gray, P.C., “Unsuitable Recommendation of Non-traded REITs and Other Unsuitable Investment Products“, 5 December 2013. 40 See AgDevCo page on Rei do Agro Limitada (last accessed 6 January 2015 http://tinyurl.com/lkadbml) and Direcção Nacional de Promoção do Desenvolvimento Rural,PROJECTO DE PARCERIAS ENTRE COMUNIDADES E INVESTIDORES : RELATÓRIO DE ACTIVIDADES (Janeiro à Outubro 2013). 41 DFID, Sida, “Annual review of the Africa Enterprise Challenge Fund (AECF)”, 2013. 42 Carrie McDermott, “Farming in Africa”, Wahpeton Daily News, 6 September 2012. 43 Friends of the Earth Mozambique and UNAC, “Lords of the Land: Analysis of Land Grabbing in Mozambique“, March 2011. 44 There are a number of development finance institutions that provide funding to Corredor Agro through the Grassroots Business Fund, including, OPIC, DEG, FMO, Norad, IFC, OeEB, Canada and Luxembourg. 45 Dan Koeppel, “Has The End Of The Banana Arrived?“, Shpot 13 May 2014. 46 “Partnership with Dole Fruit to boost banana production“, MNA, 31 January 2014. 47 “Development of a strategy to address the threat of Foc TR4 in Africa”, COMESA, IITA, FAO, et al., 23 April 2014. 48 Quifel Energy Moçambique, Lda changed its name to Quifel Natural Resources Moçambique, Lda after its parent company Quifel Energia SA changed its name to Quifel Natural Resources SA, in December 2009. 49 Avillez is a partner in the law firm MGA Advogados with Jose Oscar Monteiro, an ex-minister with Frelimo, while Jeque was made Chairman of the state owned tourism operator Mozaico do Indigo S.A.: http://tinyurl.com/mz5upuk. 50 The ownership structure was then 79.5% Hoyo One, Ltd, 20% held by Lioma – Agricultura e Projectos de Gestão, Limitada and 0,5% held by Hoyo Two, Ltd.
51 Boletim da Republica, III SÉRIE — Número 5, 2 de Fevereiro de 2011. 52 RDC Call for expressions of interest, April 2013. 53 African Century Matama, Limitada is 80% owned by African Century Agriculture, Limited and 20% by Fundaçao Malonda. 54 “Matama: o monstro está a despertar“, Jornal Domingo, 24 February 2013. 55″Aqui se pode produzir mais“, Jornal Domingo, 24 February 2013. 56″Dubieuze bankier in vastgoedproject prins“, Ambtenaar., 14 November 2009. 58 Trigon Capital Annual Report 2012. 59 Ingman is the owner of the Ingman Group and made his fortune through the sale of Ingman Ice Cream to Unilever in 2011. According to a February 2014 company brochure, Trigon Capital proposed to raise $3 million that would be invested in a Denmark-based company called Investor SPV, which would be 20% owned by Trigon Capital AS. Investor SPV and Strategic Investors, a company managed and most likely owned by Trigon Capital, would together then acquire a 51% share of Trigon MozAgri. The other 49% would be owned by a South African family whose “track-record includes founding and developing the largest Mozambican cotton production company.”: http://tinyurl.com/o68t7by. 60 “Helenius vallutab Aafrikat“, Aripaev, 20 November 2014. 61 John Hewlett led Lonrho’s farming investments in Northern Mozambique.